What better way to mark International Women’s Day than by celebrating the sportswomen who in one way or another have been responsible for my love affair with sport? My hope for this International Women’s Day is that young girls in 2016 have so many more sportswomen to look up to than I did in the days when tennis Grand Slams and the Olympic Games offered the only real opportunities to watch women competing. Not that it stopped me from finding women who showed me that females can fight just as hard and entertain just as much as the men who I saw playing sport on my TV week in, week out. The three women below epitomised tenacity, talent and passion throughout their careers and each one left a lasting impression on me. To them, I want to say a heartfelt thank you for showing me that sport is a woman’s world, too. The 1992 Barcelona Olympics had ignited my passion for the Olympic Games, and specifically for athletics. Sitting on the floor of my grandma’s flat I vividly remember the sight of Linford Christie standing on the start line of the 100m final, wide eyed and focused only on the finish line. But it was Kelly Holmes’ stunning performances at the Athens Olympic Games some 12 years later that sent shivers through me – and still does. Up to that point, Holmes’ career had been blighted by injuries. I’d watched her struggle through stress fractures, a ruptured Achilles and badly timed illnesses. And now I was seeing her as a 34 year old winning not one, but two Olympic gold medals in the 800m and 1500m. In both races she came from the back of the pack, overtaking each of her opponents one by one until the final seconds when she powered across the line, arms spread wide and an expression of complete shock on her face. “You’ve won it, Kelly” bellowed Steve Cram from the commentary box as she won her first gold in the 800m, while the rest of the nation welled up with tears for a woman who had always given her all, and finally had the prizes she deserved. Long before Rafael Nadal was chasing down tennis balls he had no right to get his racket on, Arantxa Sanchez-Vicario was the Spanish tennis player with tenacity like no other. Steffi Graf might have been the most dominant and graceful player of her era but Sanchez-Vicario was the one I would get really excited about watching. At 5 feet six inches she was one of the smaller players on the women’s tour but it made not a jot of difference to a woman who was prepared to chase down every single ball until her legs refused to carry her around the court any longer. It meant that no match was lost without one heck of a fight. The “Barcelona bumblebee,” as she was dubbed by commentators, Sanchez-Vicario was the player no one wanted to see on the other side of the net but for me, she was pure, sporting entertainment. Throughout my youth I watched Paula Radcliffe emerge as one of Britain’s best distance runners. For a long while though, it had seemed she was destined to remain outside of the world’s best, with a string of fourth and fifth place finishes at World Championship and Olympic races. 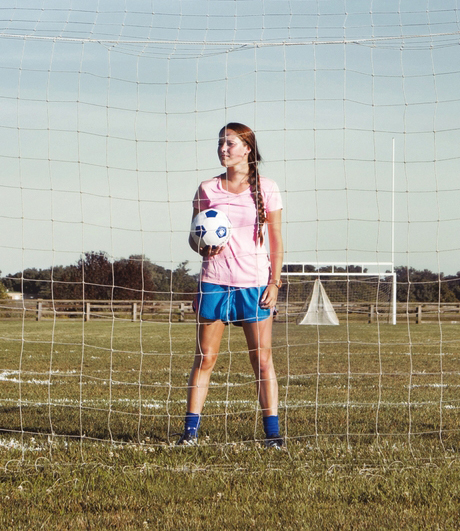 But then she found her calling, in one of the toughest events any athlete can take on. The marathon is not a race for the meek or mild. It hones in on the smallest of weaknesses and applies pressure until you either break or discover a resilience you never knew you had. At the 2002 London Marathon – her debut over the 26.2 mile distance – Radcliffe realised that despite her delicate appearance, she was in the latter camp. Her victory in a time of 2:18.55 (the second fastest in women’s marathon history) was the first time I had seen a British winner of the race that I so loved watching every year. Having seen and felt her disappointments on tracks around the world in the years leading up to 2002, Radcliffe’s success in London helped me to realise that defeats are only as damaging as you allow them to be. Kicking Off: How Women in Sport Are Changing the Game publishes 10th March 2016. This entry was posted in Athletics, Books, Running, Tennis, Women in Sport and tagged Arantxa Sanchez-Vicario, Athletics, International Women’s Day, Kelly Holmes, London Marathon, Paula Radcliffe, Running, Sportswomen, Tennis, Women in Sport. Bookmark the permalink.